Horticulture Distance Learning Course - study online, start at any time. Learn to identify and grow plants. Start a business, get a job, work in gardening. 100 hour self paced course. Study with the support and guidance of our expert tutors. To identify, propagate, and care for 80 different types of plants. The systematic way plants are classified. Structure and parts of a flower. To identify different leaf shapes. Different ways to control weeds. Making propagating and potting mixes. Identifying pest and disease problems. How and why to prune different plants. Drawing a simple garden sketch plan. To plant or repair a lawn; and lots more. Characteristics of important families including: Amaryllidaceae, Araceae, Asteraceae, Ericaceae, Lamiaceae, Fabaceae. Comparing more and less costly areas of the garden. Review of major diseases and their control: Anthracnose, Black Leg, Rots, Botrytis, Damping off, Die back, Mildew, Rust etc. Cultural techniques including watering, fertilizing, topdressing, aerating, pest and disease control. Distinguish between different plants, to enable identification of the plant species. Explain appropriate procedures for establishing a range of plants in different conditions. Describe the characteristics of plant growing media necessary for healthy plant growth. Explain the characteristics of plant nutrition necessary for healthy plant growth. Determine appropriate water management procedures for healthy plant growth. Understand appropriate procedures for pruning plants on a horticultural site. Determine solutions for the management of a range of common weeds. Determine solutions for the management of a range of common pests and diseases. Prepare a concept plan for the development of a garden. Understand commonly used plant propagation techniques. Develop guidelines for general lawn care. Develop guidelines for general tree care in a horticultural situation. Distinguish between plants in order to identify at least 120 plants on plant review sheets. Plant out a container plant following a recommended procedure. Sample and carry out simple tests on different soils. Identify a range of nutrient problems in plants. Identify a range of pest and disease problems in plants. Demonstrate the correct procedure for pruning a plant. Determine appropriate procedures for planting according to type of plant and site. Demonstrate knowledge of how to care for plants in the garden. chemical control methods to control those problems. Identify characteristics of plant growing media necessary for healthy plant growth. Explain the importance of organic matter in soil management. Describe the principles and techniques of composting. Determine nutrient problems and describe chemical and non-methods for overcoming these problems. Identify management solutions to a range of plant problems including weeds, pests and diseases. Explain the principles of Integrated Pest Management. Determine appropriate water management practices applicable to plant growth. Describe the characteristics of irrigation and drainage systems. Describe the importance of pruning to plant growth, flowering and fruiting. Describe safe use of chemicals. Develop criteria for selecting suitable plants for a landscape project. Prepare concept plans for landscape redevelopment. Draw a concept plan for a garden redevelopment. Demonstrate the correct procedure for taking cuttings from a range of plants. Distinguish between different pre-germination seed requirements and techniques, for different plant species. Determine appropriate turf species for different purposes and chosen climatic conditions. Explain the composition of lawn seed mixes and fertilizers. Observe and report on lawn management techniques. Determine solutions to lawn problems. Explain the cause and effect of common tree problems. Determine appropriate methods for treating tree problems. 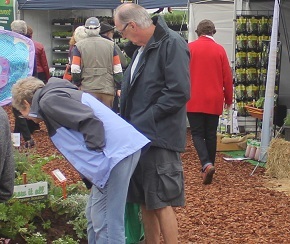 Horticulture involves “growing plants for an intended purpose”. The purpose might be very obvious such as providing food, or producing ornamental plants for an urban garden; but it could also be more obscure, such as filtering pollutants from the air, reducing the negative effects of storms, or creating an environment that is friendly to people or animals. There are tens of thousands of different plants that are grown; some as crops to harvest, and others as amenity or ornamental plants to serve some other purpose. Every one of those different plant cultivars has a different (potential) purpose. By learning to identify different plants in this course, you will expand your awareness of what plants you can choose from when you have a purpose that needs to be met. The course will raise your awareness of specific plant cultivars, but also your ability to find, identify and select other plants not specifically even covered in the course. Building this plant knowledge is a path that starts with these studies; but continues to develop well beyond this course. There are many things that affect how a plant grows; and how it survives and satisfies it's intended purpose after it reaches maturity. You need to understand how soil structure, soil fertility, water, drainage, disease, light, wind, temperature and many other things impact on plants. You also need to understand the measures you can undertake to affect all of these factors. Learning these things is learning plant culture. In the same way that learning plant identification gets you started on a pathway to continual improvement; learning plant culture does the same. This course gives you an extremely solid start. You graduate with a level of knowledge that makes you more effective at work in any horticultural situation; but beyond that, a foundation to build upon. Growing Soil improvement crops – for production of composts, fertility supplements, etc. Most of these industry sectors have huge career and business potentials. Any one could offer options for businesses that can develop into multi million pound (Euro or dollar) turnover enterprises. If you want to learn about Horticulture this is a great place to start - this extensive, introductory course provides you with a broad technical grounding in Horticulture as well as including practical elements. In addition to our high quality course materials, you will receive personal feedback to your assignments from your tutor, who is also available for you to contact with any questions you may have as you work through the course. Enrolling is easy, just head to the "It's Easy To Enrol" box at the top of this page, plus if you enrol now you benefit from a reduced course price plus 3 free eBooks. Email us at [email protected], or use our FREE COURSE COUNSELLING SERVICE. Timothy WalkerB.A. (Botany), RHS.M. Hort., P.G.Dip.Ed.